Now I know we are already on episode 4, and nowhere near close to discussing the actual American Revolution. Before we get into the Revolution itself, I need to go through the events leading up to the war. A big part of that is the French and Indian War. We see many leaders of the Revolution, from both sides, getting their start in that war. It also gives rise to some of the divisive issues that eventually lead to the Revolution. I am going to ask even more patience by pointing out that today’s episode will not even get into the French and Indian War. I want to talk about the relations between the English, the French, and the various Indian tribes that would play a role in that war. Next week though, I promise will get into some actual discussions of fighting. 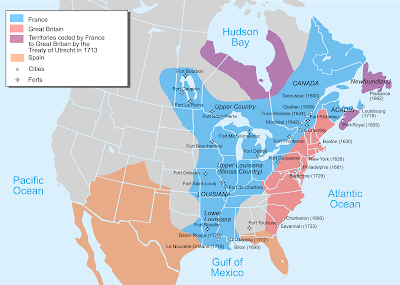 As the French and Indian War began, Britain was solidly in control of the east coast of what is today the United States, except for Spain controlled Florida. Further north, Britain had extinguished claims by the Netherlands, Sweden, France, and others. Its policy of encouraging massive colonization had helped to secure its claims. Britain had a colonial population of 1.5 million, while New France’s population totaled only around 75,000. 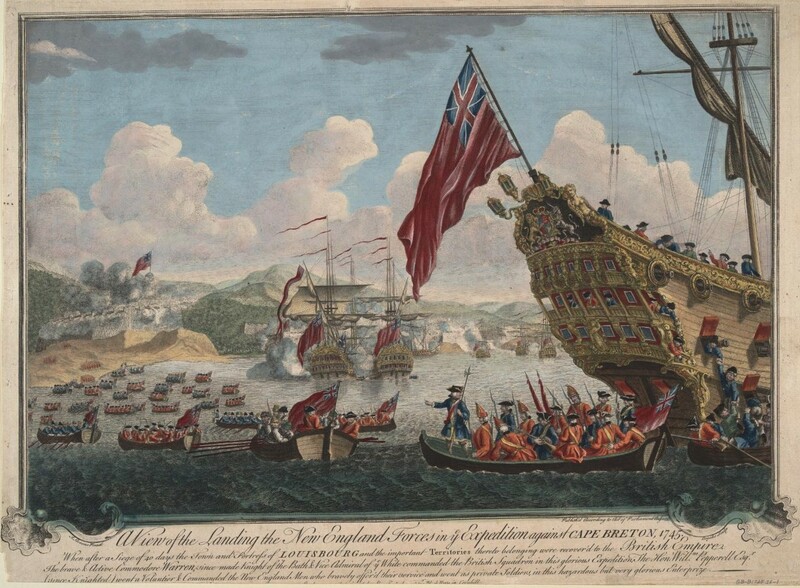 The powerful British navy had forced France to cede Newfoundland and Nova Scotia in what is today Canada after the War of Spanish Succession in 1713. At the same time, it also received control of the “Hudson Bay Company area which is most of Northern Canada today. This was not considered a terribly significant concession at the time. Much of the war was fought over control of various parts of Europe. France cared much more about valuable Caribbean colonies with large cash crops. Canada’s territory was mostly about offshore fishing rights and a thriving but not terribly profitable fur industry.. The area known as New France, and later Louisiana, accessed the Atlantic ocean via the St. Lawrence River. France still controlled land around the Great Lakes region further inland. French claims extended down the Ohio and Mississippi Rivers all the way to French controlled New Orleans. The French had made a number of failed attempts to create forts and outposts in the 1500’s. Most failed quickly from starvation, disease, and/or Indians. By the early 1600’s however, France began to establish some successful permanent outposts. More than a century later, there were long standing and well established French colonies in Quebec, Montreal, Detroit, Green Bay, and numerous smaller ones along the St. Lawrence River and around the Great Lakes. In addition, the French had established claims at the mouth of the Mississippi River, including New Orleans and Baton Rouge. France laid claim to all of the Mississippi Valley and created forts and colonies along there as well. One of the largest was St. Louis in modern day Missouri. Many of Britain’s colonial grants to colonies created no western border. Some colonies made legal claims to land all the way across the continent to the Pacific. Of course, theoretical claims did not matter much since virtually no colonists had moved west of the Appalachian mountains, only a few hundred miles inland. These mountains separated the French and English colonists for centuries. By the mid-1700’s however, French were beginning to move south in larger numbers into the Ohio Valley. At the same time, English colonists were pushing west. Virginia in particular was interested in settling the Ohio valley. These competing claims gave rise to war. All colonial powers knew that legal claims meant little unless you had people living on the land willing to back those claims, and military might to support those settlers. The War of the Grand Alliance, or Nine Year’s War (also called King William’s War) (1688-1697). In the American theater, this mostly involved border raids primarily between the Massachusetts Bay Colony and French Canadians. No major border changes resulted from the war. This war was mostly an extension of a larger war in Europe caused when the English deposed the Pro-French Catholic King James II in favor of William and Mary. The War of the Spanish Succession (also called Queen Anne’s War) (1701–1714): The European war involved all the major powers in a fight over whether Spain would fall under the control of French Royal family. 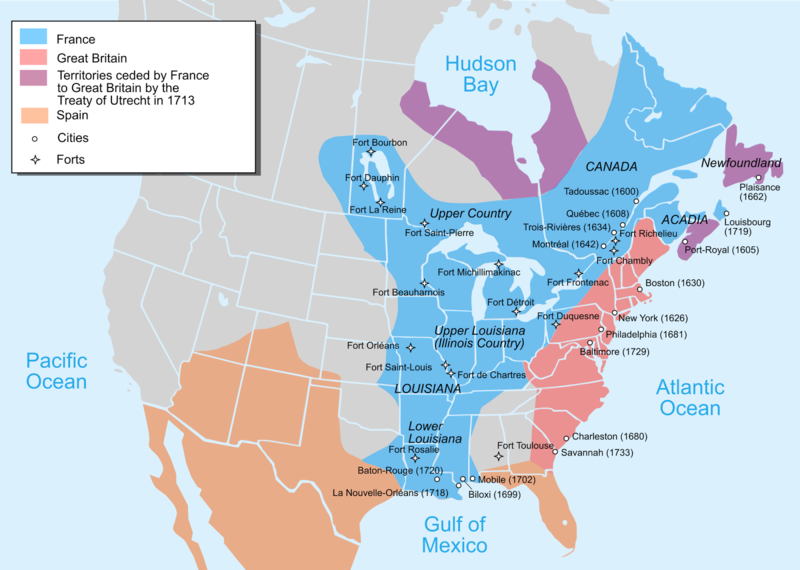 In America, this involved fighting on three fronts: between New England Colonies against New France, between the Carolinas and Georgia against Spanish Florida, and between English and French Colonists in Newfoundland. The War ended up forcing France to cede parts of northern Canada, eastern Quebec and Newfoundland to the British. Jacobite Uprising (1715-1716): France attempted to restore a pro-French Catholic King to the British throne after the death of Queen Anne. Dummer's War (1721–1725): Primarily, this was a border dispute in Maine between Massachusetts and New France. The War of the Austrian Succession (1740–1748): This actually included several wars, including the War of Jenkins Ear, started after a Spanish naval captain cut off the ear of the British merchant vessel captain named Jenkins, the First Carnatic War, which involved disputes over colonies in India, and King George’s War in America. It also included another attempt by the French to encourage and support another Jacobite uprising in Britain to overthrow the protestant King George. The American theater was known as King George’s War. involved intense fighting between New England colonists and the French colonists to the north, along with their Indian Allies. Second Carnatic War (1749–1754): France and England fought again over control of various parts of India. Again, these were only the wars Britain fought against France during this period. Britain also participated in the Great Northern War (1700-1721) in support of King George I, who was involved because of his rule in Hanover. Britain even found time to ally itself with France in the War of the Quadruple Alliance (1717–1720) against Spain. Britain found itself in an almost constant state of war with someone for the preceding couple of generations. More often than not, France was on the other side. In fighting these wars, Britain was not always sacrificing a generation of soldiers. Most European powers fought wars with relatively small professionally-trained armies. Paying for a good army was a cost of running a country. Using that army effectively is how one obtained more wealth and political strength against one’s neighbors. In the colonies, the British government often relied on colonial militia to provide the necessary soldiers. This often led to a much larger toll of human life for the colonists. In King George’s War, for example, Massachusetts devoted a great deal of money and manpower to push back French borders and claim more land for the colony. It is estimated that around 8% of the adult male population in Massachusetts died in that war. When Britain decided to give back those captured lands to France in the interests of securing other land in Europe, many colonists were outraged. They were fighting for their lives, while European nobility simply used them as pawns. In the early 1750’s, when both Britain and France began a shoving match over the Ohio Valley, no one would have been surprised to see another big war on the horizon. The resolution of King George’s War in 1748 essentially passed off the competing claims between Britain and France to a commission to work out the details. The Commission never resolved anything, leading both countries to push ahead and take what they could get. At first glance, it would seem that the French had a very untenable position. There were about 75,000 French colonists in all of North America, compared to about 1.5 million colonists living in the British colonies. Militia would make up the bulk of the forces. Britain’s colonial population twenty times that of France gave it the clear advantage.. The French, therefore, were much more reliant on alliances with Indian tribes. French colonies tended to have closer relationships with the native population than did the British. French trappers had a thriving fur trading business with local tribes. Frenchmen frequently intermarried with the Indians and had formed strong bonds with them. British colonials traded with local tribes, but more commonly maintained their own separate communities with less interaction. At this time, there were virtually no European colonists from either side living in the Ohio Valley. Most of the land fell under the control of the Iroquois Confederacy. Parts of the border areas to the north and east were controlled by the Algonquin speaking Wabanaki Confederacy. Neither of these groups had any sort of strong central government. Rather, they were coalitions of smaller tribes who interacted and traded with one another, but operated independently. Today we often look back with hindsight on the Indian tribes of North America as inferior militarily, doomed to give way to European conquest. But in the mid-18th Century, several very powerful tribes and confederations stood as substantial military forces, with the ability to hold their own against the European powers. Colonies and nations entered into treaties with them, went to considerable expense to maintain their alliances, and recognized that respect for native cooperation was a key to colonization. If the various tribes had remained united in opposition to the European powers, we probably would have seen a very different story unfold. Unfortunately for the Indians, they never could develop a sustained united opposition, at least not until the 19th century when it was far too late. Rather, many tribes were more interested in European alliances that would improve their positions against neighboring tribes. Aside from these divisions, the devastation from European diseases also contributed largely to their eventual downfall. At the time though, the Iroquois Confederacy dominated the Great Lakes Region. The origins of the Confederacy are not very clear. However it seems that they organized sometime in the 1400s. 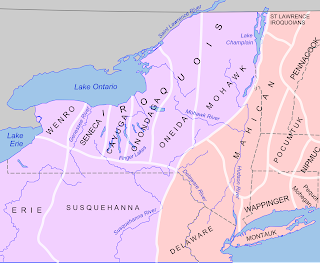 The Confederacy originally comprised five tribes Mohawk, Oneida, Onondaga, Cayuga, and Seneca. In 1722, a sixth tribe joined, the Tuscarora. Based on language and cultural traditions, anthropologists believe the Iroquois migrated north from southern tribes, invading the Algonquin speaking region of the Great Lakes. According to oral history, these divided Iroquois tribes had fought with one another continuously for generations. Confederacy allowed them to work together as a coalition of tribes in their own mutual interest. They shared a common language, culture, and religion. The need for mutual defense against other larger hostile tribes probably also contributed to the decision to unite. The Iroquois were never a particularly large group. For most of their existence, the five tribes combined probably never amounted to more than a few thousand people. Their territory was originally limited to what is today part of upstate New York and a small sliver of southern Canada. 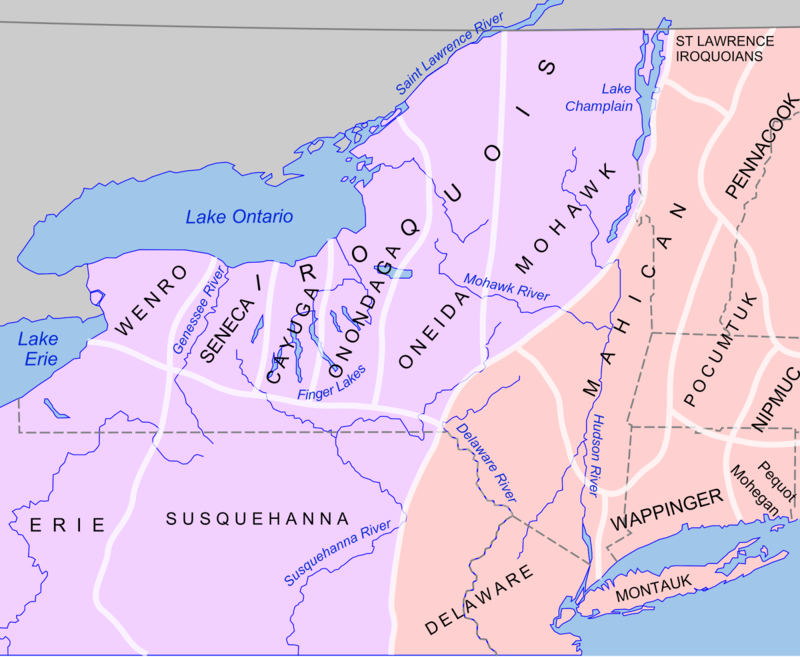 The Iroquois Confederacy was able to take on power exceeding its size after forming a trading alliance with the Dutch who, in the early 1600s settled in what is today New York. With Dutch arms and ammunition, the Iroquois became one of the first tribes in the region with significant numbers of firearms. This advantage allowed the Confederacy to expand its territory drastically. The Iroquois claimed control of lands which now make up New York, Pennsylvania, Maryland, Virginia, West Virginia, Kentucky, Ohio, Michigan, Indiana, and Illinois. Some of these claims seem to be a reach as the Iroquois could never really sustain the subservience of other tribes in all of these areas. Much of the focus was on maintaining the valuable control of trade with the European powers. Many tribes at least nominally acquiesced to Iroquois control while still largely running their own affairs. The result, however, was that the Iroquois controlled all diplomatic relations with the Europeans. They made treaties on behalf of other tribes who were often powerless to object to them. For most of the 1600s, the Iroquois were hostile to the French because of French alliances with the Huron, an enemy tribe of the Iroquois. It did not help that for a period of time the French decided to kidnap as many Iroquois as they could to ship back to France as galley slaves. Around 1700, the Iroquois adopted a policy of neutrality, which allowed them to play themselves off between the French and British as it suited them. Generally though, when forced to pick a side, the Iroquois sided with the British. Many conquered tribes were not terribly happy living under Iroquois rule. 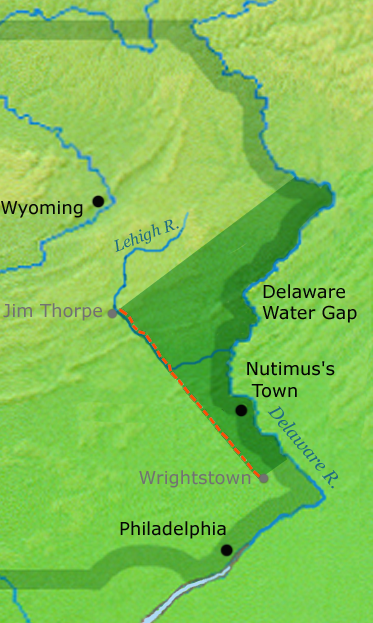 The Delaware and Shawnee thought they were cheated out of land in Pennsylvania through several treaties. One such deal, which will be more of an issue later, was the Walking Purchase. In 1737, the owner of Pennsylvania, Thomas Penn found a 50 year old document between his father William Penn and several local Chiefs. The document, which Penn characterized as a deed, granted to Penn land for as far as a man could walk in a day and a half from an area near modern day Wrightstown PA. Although the 1686 document had never been executed, was not signed, and despite the fact that all of the parties involved were now dead, Penn decided to enforce the terms of the agreement and measure off the land that that was acquired by it. To determine the land, Penn hired three long distance runners to maximize how much land they could walk in a day and a half. Roads were cut for them and boats stood by to carry them over any water impediments in order to maximize their distance. The best runner made it over 65 miles to an area near modern day Jim Thorpe. A creatively drawn border from that point back to the Delaware river added even more land to the claim, about 1200 sq miles in all. Iroquois leaders took bribes (or gifts depending on one’s perspective) from the colony and ratified the deal. At the meeting to resolve disputes, the Iroquois leader Canasatego insulted the Delaware laying the blame on them for dealing with the English rather than allowing the Iroquois to negotiate on their behalf: “You deserve to be taken by the hair of your heads and shaken till you recover your senses and become sober. We have seen a deed signed by your chiefs above fifty years ago, for this very land. But how came you to take upon yourselves to sell land at all? We conquered you; we made women of you.” The Delaware did not have the power to resist and were forced to leave the land immediately, some moving north, others moving west. In another 1744 Treaty in Lancaster, the Iroquois sold lands in the Shenandoah Valley also home to Shawnee, Delaware, and Catawba tribes. This time, however, the Iroquois themselves felt cheated after the Virginians claimed the treaty gave them control of the entire Ohio Valley as well. Still, the Iroquois remained on good terms with Virginia, as the Colony had not yet tried to settle the area. The Iroquois were more afraid of French incursions and needed the British to support Iroquois presence there. The Iroquois themselves never became a particularly large population. At their height, they numbered around 12,000. They likely controlled or claimed control over about 100,000 other native people throughout the larger region. The Wabanaki were also a group of different tribes. The original Wabanaki Confederacy consisted of the Abenaki, the Penobscot, the Maliseet, the Passamaquoddy, and the Mi'kmaq. They spoke an Algonquian language, very different from the neighboring Iroquois. They originally populated New England and Eastern Canada. New England colonists mostly wiped out these tribes, with survivors moving inland toward the Great Lakes. This history with New Englanders made them particularly likely to side with the French in any dispute. The Wabanaki were the traditional enemies of the Iroquois. They were larger in number but not nearly as well organized or armed. Some tribes allied with the Wabanaki did speak the Iroquois language but were not part of the Six Nations of the Iroquois Confederacy. Many of these tribes were early allies with French explorers and traders. They developed a booming and profitable fur trade with the French. This interaction unfortunately resulted in the death of large portions of their population from European diseases. These tribes further suffered from Iroquois expansion during the 1600s. Many smaller tribes were wiped out or forced to migrate to other lands. As I mentioned already, many New England tribes were forced into Canada by British colonists. Without getting into too much detail, suffice it to say that if the British and Iroquois were on one side of a fight, the Wabanaki and most other Indians not under the control of the Iroquois would be on the French side. I’ve already mentioned the Delaware who lived under Iroquois control. As a result of land claims in Pennsylvania, the tribes had divided into the Eastern Delaware, who lived in the Northeastern part of the colony, north of the Walking Purchase, and the Western Delaware, who lived in what is today Western Pennsylvania and the Ohio Valley. Other tribes living among the Western Delaware were the Mingo and Shawnee, also under Iroquois control. Around the Great Lakes, we find other tribes generally friendly with the French. These included the Huron, Ojibwa, Ottawa, and Wyandot. Further west, we find the Illinois Confederation.The Illinois had less contact with Europeans generally. If they did, it was usually the French. Further south, the Cherokee dominated. This group, found mostly around the area that is now eastern Tennessee, and the western Carolinas, interacted with the southern colonies. They traded for arms and other supplies, becoming rather dependent on the English for trade. Further south the Creek tribes still lived in parts of what is now western Georgia and Florida. The Creek had less contact with the English and tended to interact more with Spanish outposts along the Gulf coast. As Georgia moved into their territory they began to trade more with the English colonists there as well. Ok, got all that? For the purposes of the upcoming war, just remember Iroquois - Pro-English, Delaware, Shawnee, and Mingo, subservient to Iroquois. Pretty much all the other northern tribes: pro-French. We are now finally done with introductions and backgrounds. Next week, the Virginians move into the Ohio Valley igniting another world war. Treaty of Lancaster, 1744 (1905). The Iroquois Confederacy, by Rufus Blanchard, (1902). The Border Wars of New England, commonly called King William's and Queen Anne's wars, by Samuel Adams Drake (1897). The peace of Utrecht : a historical review of the great treaty of 1713-14, and of the principal events of the War of the Spanish Succession, by James W. Gerard (1885). The Walking Purchase, by H. A. Jacobson (1911). The Papers of Sir William Johnson, by Sir William Johnson (1921): Johnson served as the British Indian Agent, and lived with the Iroquois. He will feature prominently in future episodes. Fontenoy and Great Britain's share in the war of the Austrian succession, 1741-1748, by Francis Henry Bennett Skrine (1906). The War of the Austrian Succession, by Reed Browning (1995). An Indigenous Peoples' History of the United States, by Roxanne Dunbar-Ortiz (2014). The War of the Spanish Succession 1701 - 1714, by James Falkner (2015). The Great Law and the Longhouse: A Political History of the Iroquois Confederacy, by William N. Fenton (2010). The Ambiguous Iroquois Empire, by Francis Jennings (1984).